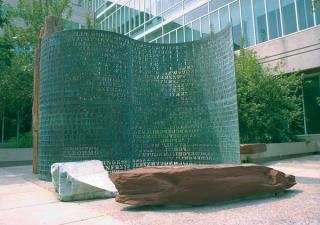 Kryptos is a sculpture located on the grounds of CIA Headquarters in Langley, Virginia. Installed in 1990, its thousands of characters contain encrypted messages, of which three have been solved (so far). There is still a fourth section at the bottom consisting of 97 or 98 characters which remains uncracked. This webpage contains some information about the sculpture, including some photos collected from around the web, some rubbings of the sculpture taken by your intrepid webmistress, links to other articles and Kryptos discussion groups here and there, and information about other encrypted sculptures which have been created by the sculptor, James Sanborn. Quickstart Guide - Check here if you are new to the wiki! Look Ma, I can do Cyrillic!